Clad in a sweet pair of L.A. Gear hi-tops and patchwork short shorts, spoiled twenty-something Tory (JENNIFER ANISTON) moves into a dilapidated bungalow in the middle of nowhere with her father. Unbeknownst to the father/daughter duo, and the trio of painters they contract to spruce up the place, there is a gold-obsessed leprechaun (WARWICK DAVIS) locked in a crate in the basement. While Tory and handyman Nathan (KEN OLANDT of APRIL FOOL’S DAY and SUMMER SCHOOL fame) set to painting the side of the house electric blue, the developmentally disabled Ozzie (MARK HOLTON, “It’s not for sale, Francis!” from PEE WEE’s BIG ADVENTURE) frees the wee monster from his wooden prison. 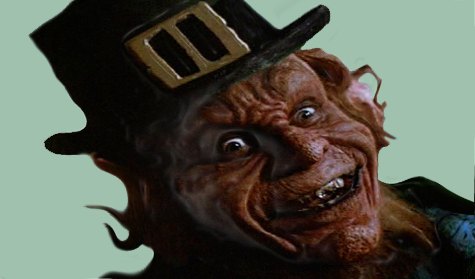 No one believes Ozzie at first when he tells of seeing a leprechaun in the basement, but they all come around pretty quickly after it starts tirelessly terrorizing them for his gold. The leprechaun is pretty persistent, and manages to send Tory’s father to the hospital, injures Nathan’s leg with a bear trap, and kills a cop and a precious metals expert in his quest. After Tory returns what is believed to be all of the gold hidden in a wishing well, the leprechaun keeps up with his attacks, demanding the return of a final missing coin unfortunately located in Ozzie’s stomach. Nathan and Ozzie distract the leprechaun by tossing an assortment of pumps and flats into the yard (aside from having a thing for gold, the leprechaun also has a shoe fetish), so Tory can slip away to a local convalescent home to learn that only a four-leaf clover can stop the pint-sized psycho. Tory and the boys eventually manage to immobilize the tiny terror with a clover and imprison him in the wishing well before the end credits, but not before viewers are subjected to a nightmarish mishmash of bad puns and sight gags that were better delivered by FREDDY KRUEGER. Is this the one with the pogo-stick impalement, too? Lotsa fun, that. 🙂 Plus, nice to see Aniston when she still had a little meat on her bones. Hey-o! Yes, this is the one with the death-by-the-pogo-stick scene. True that about Ms. Aniston. She looked to be of a normal weight when this was shot — which makes her seem gigantic next to the stick-figure she rocked on Friends.